I’ve been eating black raspberries at every meal now that they’re in season. They were in my oatmeal at breakfast, my yogurt at lunch, and in my salad at dinner. I love how they look next to the beets. The colors would make a lovely combination for a duotone quilt. If only I had made the salad before the sun set, the picture would have turned out a lot nicer. But of course I got distracted with gardening and didn’t come in for dinner until dusk. The hazards of summer. Put vinegar, oil, yogurt and salt in a bottle or jar and shake until blended. Pour over lettuce and toss. Grate the beet and sprinkle over salad. 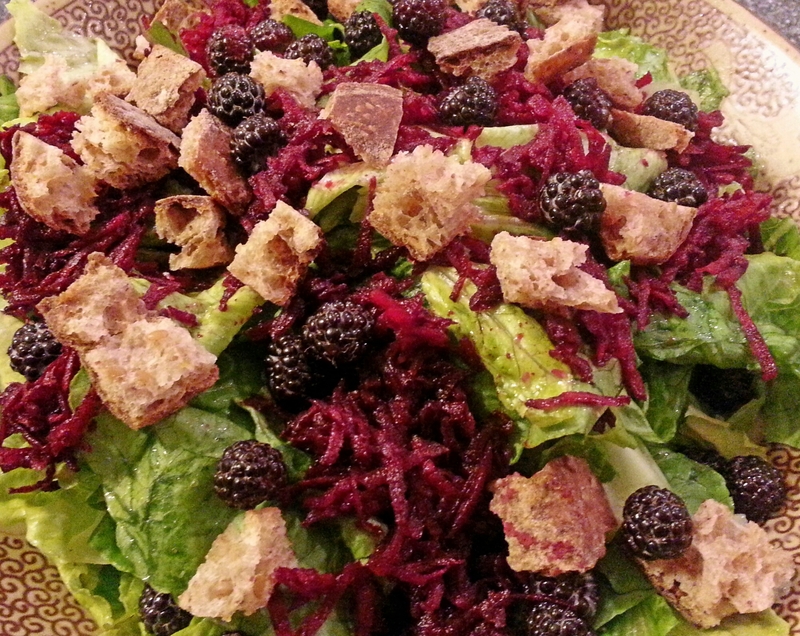 Sprinkle on croutons and raspberries. Enjoy! Makes one big dinner salad or 3-4 side salads. Refrigerate extra dressing for later use. Black raspberries are ripe! Time to make black raspberry juice! Taking the photos before sunset - how I wish I was always that organised too, don't beat yourself up though this salad still looks great!